Sports betting with bitcoin was one of the first use cases for cryptocurrencies that caught on. Because of anti-online gambling restrictions in countries like Australia and the United States, many punters were forced to use crypto friendly sportsbooks if they wanted to gamble on the NFL, NBA or the English Premier League. Bitcoin sports betting sites are well aware that the key to success in the smartphone era is to have a very slick betting app. As a result, they have invested heavily in sports betting apps for iPhone, Android and iPad that allow users to check scores, bet in-play and enjoy the same advanced features as apps from Bet365, Ladbrokes and William Hill. This guide to the top cryptocurrency mobile betting sites covers sportsbooks who exclusively accept Bitcoin, Litecoin and Ethereum and also more established sites that accept cryptocurrencies, credit cards, bank wires and other popular payment methods. We only feature bitcoin casino apps, mobile poker rooms and iOS/Android bookmakers that develop top quality mobile software for both smartphones and tablets. 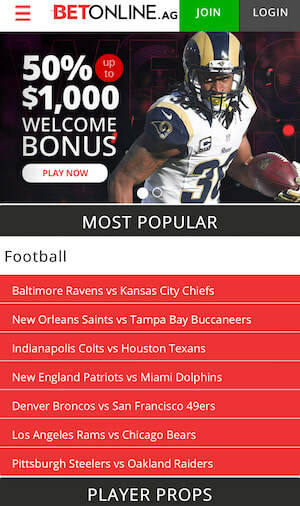 Some of these bookie apps offer advanced features like live sports streaming and cash-out's, while others allow you to create anonymous betting accounts from the USA, UK, Canada or Australia. Bovada is gambling site that offers a wide variety of options for players looking to gamble with Bitcoin. Not only do they provide an attractive mobile site and playing interface, but they also have more options than other mobile gambling sites. This includes popular casino games, sports books, live dealer options and even horse racing. The mobile interface for Bovada is excellent. Everything is very neat and easy to navigate. The top menu bar allows you to quickly swap between areas with no lag, and the icons are large and easy to read on nearly any device. Every area of the site loads quickly, and it’s actually optimized for mobile users. If you’ve ever used a site which was not optimized for mobile, then you’ll know what a relief this is. There’s actually two menus on the mobile site, which is kind of a waste since they do the same thing. You can ignore the collapsable one for the most part, because the quick links take you everywhere you’d need to go anyway. 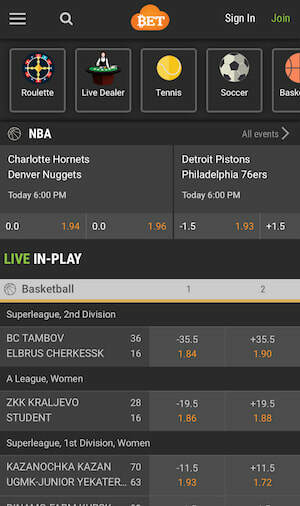 The cashier for Bovada is easy to use, and it works well on mobile devices. You’ll be able to easily cash in and out using a Bitcoin address or QR code. Players can choose between Bitcoin and Bitcoin Cash, and deposits are automatically converted to US dollars so players don’t need to worry about Bitcoin price fluctuations when playing. Bovada offers a wide variety of casino games which play beautifully on mobile devices. The games are actually very well done, and they look nicer than many other mobile options available. If you’re interested in trying them out before registering, you can hit play and then deny the prompt to create an account. This will allow you to do some free play to see how well the games play on your device. Players will be able to play several high-quality and fun casino games verses a computerized dealer such as blackjack, roulette, slots and poker, but you can also play live games as well. The casino features many live dealer options and poker tables where you can play with other players, and It’s easy to browse these options on mobile too. Nitrogen Sports is a Bitcoin based gambling site that allows players access to a wide variety of sports betting options and casino games. Their mobile site offers excellent ease of use for those looking to wager BTC on the go. The UI is pretty nice, and everything is easy to navigate. The only annoying thing about the mobile site is that sometimes it’s hard to go back to the main site once you enter a certain area, and you may need to reload the main page to do so. This is mostly a problem when swapping from the casino games to the sportsbook, because it transfers you to a different domain for some reason. Once you’ve settled on a particular focus such as the sports book or the casino games, things are much smoother. The menu is contained in a collapsable section which is very good at staying out of the way but still being there when you need it. Depositing money to play games is easy, and you can do it on the mobile site without any issues. Just generate a new address and send your Bitcoin to that address to begin playing. Withdrawals are equally simple, with a minimum withdrawal of just 0.01 Bitcoin. They even have a transfer feature which allows you to send money to other Nitrogen Sports accounts which is pretty cool for if you want to help a friend get started playing. Using the menu, you can easily move between different sports books. Having them conveniently located all in one place on the collapsable menu makes it easy to move between areas and participate in different sports such as Basketball, Hockey, esports, ect. They also have a seperate menu which will direct you to any games which are available for live betting right now, saving you the hassle of having to look through everything individually. The games at Nitrogen Sports are fast loading and simple. This basic interface allows them to be played easily on nearly any device, even older ones. The interface is set up in a way that you can easily access different games such as dice to start playing. However, if you’re interested in more advanced head to head style games with other players, then you can also give their Poker set up a try. As long as you have money available to play with it really is a one click operation to start searching for a seat in a game. Interested in bigger winnings or something more challenging? Nitrogen Sports also allows you to access their tournament schedules from the mobile interface. You can browse the line up to see which games have events going and then register yourself to participate on the chosen date. Playing games in this manner is a much better experience than just playing against a computer opponent, and it gives mobile players the chance at real player to player competition. BetOnline Sportsbook was one of the first online gambling sites to accept cryptocurrency, and they’ve kept up that loyalty by continuously providing an excellent mobile experience to crypto players. They offer a wide assortment of casino games, sports booking options, live play choices and even horse racing, which doesn’t get much love in the crypto niche. The interface for the mobile site is pretty nice and easy to use. The collapsable menu gives you quick access to all of the key areas of the site including deposits, promotions, sportsbooks and casinos. The only annoying thing about the mobile site is that until you make a deposit it will try to push you to the deposit screen, interrupting your browsing, until you give them money. The mobile site makes good use of quick links and icons so that users can swap quickly between areas, and everything seems to load smoothly. There’s no hang ups when browsing and no dead end areas where you get stuck in the navigation chain. BetOnline.ag has a great cashier for mobile devices. Just hit the button up top that says deposit and select cryptocurrency as your option. They allow users to deposit using Bitcoin, Ethereum, Bitcoin Cash, Litecoin and Dash. Once you’ve begun initiating your deposit, the mobile app will also prompt you to take advantage of available deposit bonuses! Just select one to have it applied when you make your deposit. The withdrawal process is much the same, and BetOnline offers same-day payouts to their users. Where BetOnline excels is their mobile sports betting. They offer a wide selection of sports that cryptocurrency enthusiasts can wager on, including hockey, soccer, basketball, tennis and horse racing, which is often excluded from many crypto betting sites. After selecting your sport of choice, you can quickly see the available matches at a glance. Clicking on one of these matches allows you to add it to your betting slip with a clear and easy to understand pop up interface. You’ll also be able to easily select and use any free plays here that you might have available. 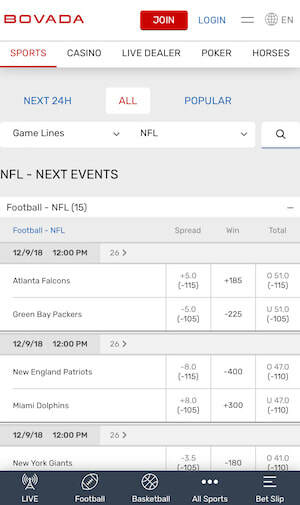 The menu has a seperate section for live betting, making it convenient for those who are only interested in live games to find those events quickly. While the mobile site itself is nice, the interface for accessing the games is confusing. In order to play you need to actually scan a QR code to access the poker games. This adds an annoying and confusing step which many players will likely not like. In addition to this, games can’t be accessed for testing purposes at all without an account. In fact, they won’t even let you see the casino game selection on mobile without registering first, which is pretty frustrating. Once you do get to the games however, they look quite nice and run well. If you have a decently modern device (iPhone 5 or Android 6) then you should be able to play on mobile without issue. They have a large selection of table games, slots, jackpots and live dealer games. However, they don’t seem to allow any free play to test the games which is disappointing. Cloudbet Bookmaker is a popular cryptocurrency betting sites that offers users a slick user interface to play with. They offer a wide variety of gambling options including a large sports book and some very attractive casino games that play great on mobile devices. It’s a great option for players looking for a great mobile gaming experience. CoudBet’s mobile interface is quite slick, and it looks like it was actually designed for mobile devices. It fits the screen perfectly, and the icons have been enlarged for easier browsing. Unlike other mobile apps you won’t have to zoom or struggle to see text when navigating this site. The collapsable menu is both handy and out of the way. A quick tap allows you access to the entire menu of games, betting options and account options, but it vanishes when you’re done so as not to take up any space whilst you are playing. Depositing cryptocurrency at CloudBet is easy, and it works just as well on mobile as it does on the desktop version. Simply access your account dashboard and choose the currency that you want to use. You can pick from Bitcoin or Bitcoin Cash. Generate your deposit address and send your desired currency to your CloudBet account. Withdrawals are also pretty easy, but you may be asked to verify your identity for large withdrawals. The sportsbook is organized in a way that it’s very easy to find the particular sport that you’re looking for. The interface for games is nicely done, and the information is displayed in a way that players can quickly find the matches that they are looking for. A quick tap on the match ads it to your betting slip, and by using the menu at the bottom you’ll be able to confirm your bets quickly. The games on this platform are nice looking and fast loading. Most users with a modern phone should be able to play them without issue. If you’d like to try them out before wagering any money, they also offer a free play mode which does not even require an account. Mobile players have access to a wide variety of slots, jackpots and table games such as roulette or blackjack. In addition to their many computer opponent based games, mobile players can also access a variety of different live casino games as well. This provides the ultimate gambling experience for players while allowing them to play from the comfort of their homes or on the go. Players can participate in roulette and baccarat here. No, most cryptocurrency sports betting sites operate offshore so they would not pass Google or Apple's strict terms for getting listed in their app stores. They can, however, be installed by simply visiting each site from your smartphone or tablet. WHICH CRYPTOCURRENCIES DO THESE SPORTSBOOK APPS SUPPORT? All the mobile bookies listed on this page allow you to deposit and withdraw with bitcoin, while a number of others also allow you to sports bet with Ethereum, Bcash, Litecoin, Dogecoin or Dash. WILL THESE BTC BETTING APPS WORK ON ANY SMARTPHONE? Yes. Since they are browser-based, they will work on any iPhone, iPad, Samsung, LG, Huawei, Google Pixel, OnePlus or HTC. CAN GAMBLERS FROM THE UNITED STATES OF AMERICA & AUSTRALIA USE THESE APPS? Yes. Apart from CloudBet, citizens of the United States are welcome at all of the mobile bookmakers listed on this page. There are no restrictions against Australian citizens. In our forum you can find a lively discussion on the best USA betting sites so that may also be a useful resource. IS IT LEGAL TO SPORTS BET WITH BITCOIN? Most countries like Australia and the United States make it illegal for financial institutions to interact with offshore bookies but they don't target or prosecute citizens. This is not legal advice and we recommend that you do your own research on the legality of online gambling in your jurisdiction. The iPhone and later Android smartphones completely changed the way that we interact with the world. Sports betting is one industry that was completely turned on its head thanks to devices like the iPad, Samsung Galaxy or iPhone X. Anyone who could afford one of these new gadgets now had access to a sportbook in their pocket. It was no longer necessary to visit your local betting shop or phone a bookmaker to check what odds were available on any given day. 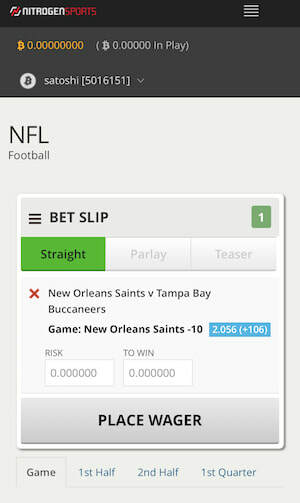 You could now bet on NFL football, English Premier League soccer or even horse racing from the palm of your hand. These mobile sportsbooks offer live betting odds on thousands of sports events from around the world, you could wager in-play via your favourite bookmaker app and even watch a live stream of the sporting event for free.